See what our guests are saying about their vacations. There are no words to express our gratitude after this week aboard Allende! Several times throughout the week we each would use the line, “This is amazing!” The boat was beautiful, the sailing was great and the hospitality was over the top. The food was outstanding. We tried to choose a favorite meal and we couldn’t. Round Two on Allende ROCKED. Tom & I had bragged to our friends about your knowledge, culinary skills, sailing ability and all-around greatness! And you both delivered. Queremos agradecerles por las hermosas vacaciones en vuestro catamarán, todo estuvo 10 puntos!! Thank you for the beautiful vacation aboard your catamaran, everything was over 10 points! What an amazing trip!!! You made our kids comfortable so that they could not only enjoy themselves but also learn so much about the BVI. This has been our best vacation—mostly because of you two. Thanks so much for welcoming us into your home...it truly is beautiful. We love the view from your office! What a fabulous week we’ve had with you and Friday, too! We have felt so welcome and so well taken care of. 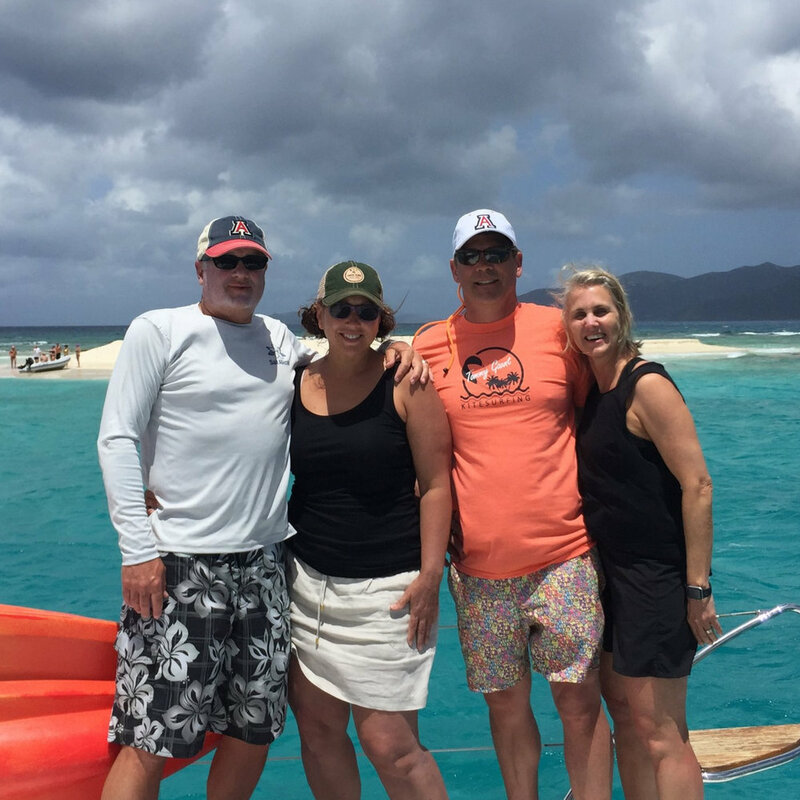 BVI is a beautiful place and we’ve enjoyed the sailing, snorkeling, sun, food, drinks and the camaraderie with old friends and new. Sailing with Graham and Kristiann is like sailing with your best friends. They are both so friendly and kind. Graham confidently and safely sailed us from island to island. He professionally made sure we all knew the safety procedures before beginning our journey. After that, he was all smiles and good times. He even helped us when the sea got a bit rough and told us where to sit so we wouldn’t get sick or wet. Kristiann’s food was delicious! Somehow she knew exactly when we would be hungry and had the fresh, tasty food ready whether it was for breakfast, lunch, snack, or dinner. She was even versatile enough to make some fish we caught into our midday snack instead of what she had initially planned! Together they planned a great trip for us with just enough time sailing, some time on land doing excursions, and some time just anchored and chilling in a bay. The boat was always neat and tidy and really felt like we had plenty of our own personal space if we wanted to get away from everyone else without being held up in our cabin. We all agreed that our week with Graham and Kristiann on Allende was the best sailing trip we have had, despite our two boys being committed monohull fans! Specifically, G&K are enthusiastic about sailing so were happy to blast around as much as we liked. They allowed our involvement and were helpful with tips and instruction. G&K took turns to snorkel with us, being wonderful guides and spotters underwater. Catering was fabulous. Their professionalism and attention to detail was manifest in everything they did and included some lovely personal touches. They have given each aspect of hosting serious thought and none of us could find fault with a thing. An absolutely fantastic crew in every way! We’re so thankful to have found the Sail Allende team. We just returned from a week’s sail where Graham, Kristiann, and Friday (the crew dog / entertainment) treated us to the best time in the USVI and BVI. Pre-trip communication was professional and timely. Allende is kept in fanatical shape. Graham is careful and professional at the helm. And Kristiann kept our bellies full with delicious cocktails and the most 5-star amazing food. As a chef, Kristiann doesn’t skimp - nearly everything is homemade aboard and suited our diverse group’s taste buds. The Sail Allende team created a customized journey for us. We can’t say enough about this crew! If you’re looking for a crewed charter, look no further. We promise, you won’t be disappointed! To say that Sail Allende is exceptional is a huge understatement! The catamaran, her crew, including the most amazing boat dog named Friday, were impeccable, on-the-ball every second of our trip and attentive to our every need. One goes on a trip or has an experience they always seem to find something to improve on....but, honestly, I’m unable to find anything. They manage to hit every check box and as far as I’m concerned, they set the benchmark for quality service and crewing a catamaran. Wow!!!! Vacation of a lifetime! Graham, Kristiann and Friday were such incredible hosts. My husband and I travel to the BVI every December, but this year Sail Allende made sure we saw parts of the BVI we’ve never experienced before. The boat was spacious, beautifully furnished, and comfortable. The food, ohhh the food, the food was just as good as a five-star restaurant. Kristiann is a great chef and her love of cooking comes through in it’s delivery. The menu was perfectly crafted to account for some of my crazy and unfortunate dietary restrictions. I was so impressed that Kristiann was able to remember everything. Graham was such a wonderful, friendly and knowledgeable Captain. We learned so much about understanding the weather, wind, waves, stars, etc.. He has such a passion for sailing and we really admired how he wants to share it with everyone. 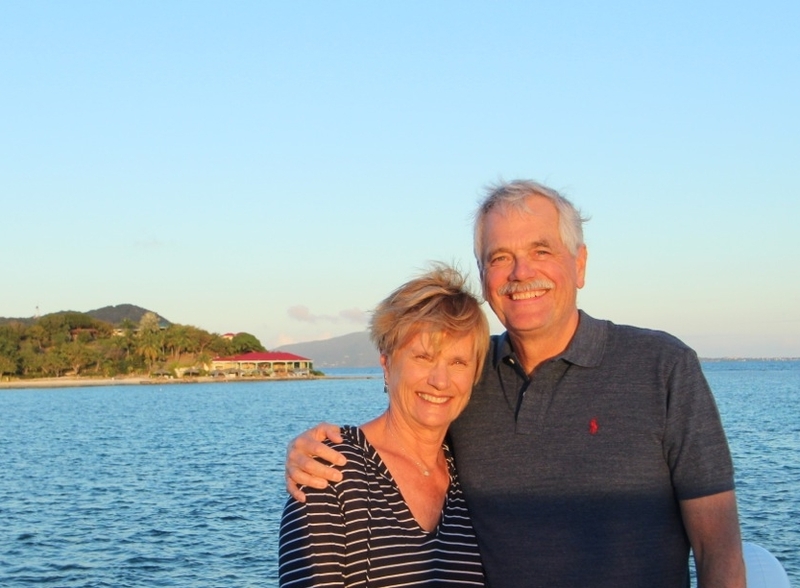 We got engaged and married while sailing on Allende in the BVI. Sailing with Allende was truly one of the most magical experiences of my life! This is by far the most relaxing vacation. The food, travel, boat and most importantly the company made the trip. The food, local knowledge and travel were first rate and we can’t wait to get more of our friends and family on board with you. Safe travels and happy sailing, we’re counting down the days until our next Painkillers with y’all! Amazing is the word I have used to describe our sail. So many highlights - actually sailing at the helm (wow! ), the blue Mediterranean, the great friendship with all the wonderful fun dancing, jumping off the boat to float, dinghy rides, eating & drinking. Our cabins were so comfortable and your hospitality - always there with my morning latte plus so many more wonderful extras that y’all provided. — J & M, Abu Dhabi, U.A.E. From the moment we set foot on Allende, we have been enamored with your hospitality and skills! We were impressed with Captain Graham’s sailing knowledge and expertise, relationships with local people and places. His ease and comfort in any and all situations made for a most relaxing and enjoyable time aboard. The respect and love the islanders have for both of you is apparent. And what can we say about Kristiann’s cuisine? These are a few of the words we made up when we were using fabulous, delicious and scrumptious way too much: scrumptilicious, splentabulous and fabulistic! The presentation was always beautiful and the taste was out of this world. Every meal just got better and better. We had a fantastic experience! My wife and I took our 2 children (13-year-old boy and 9-year-old girl) on a 9-day charter. Captain Graham and Chef/First Mate Kristiann welcomed us to their home. They were eager to assist with any and all water activities including snorkeling, paddle board, kayak, hammock, the floating unicorn, etc. The food was amazing. Kristiann made almost everything from scratch and made it seem effortless. Each meal was expertly prepared with consideration for each individuals likes and dislikes. The presentation was artistic and the timing was impeccable. Each morning started with gourmet coffee. We ended each evening with a discussion about the following days activities. Graham and Kristiann had options at every destination to meet our expectations. They could get us on the best mooring or anchorage in crowded locations or tuck us into a secluded cove if that is what we preferred for the day. If it was possible to sail we were sailing. Graham and Kristiann love to sail. They had the spinnaker in the air several times on our trip. The 2 of them have clearly spent a lot of time together on the water. They worked together like a well oiled machine. Graham and Kristiann own Allende and it shows. We have chartered multiple times in BVI and their professionalism stands out in my eyes. They were willing to pick us up early and keep us on board late when our flight was delayed. Their attention to detail with boat care and maintenance was obvious. They knew the boat inside and out and were prepared to handle any situation that arose. Friday is an amazing dog. He is well mannered and absolutely loves the water. I think he spent more time in the water than on the boat. He attracts a lot of attention from other boaters when he is jumping off the front of the boat, swimming around the boat, or going for a ride on the paddle board. Thank you for an amazing week! This was a “bucket list” trip and you exceeded all of our dreams. 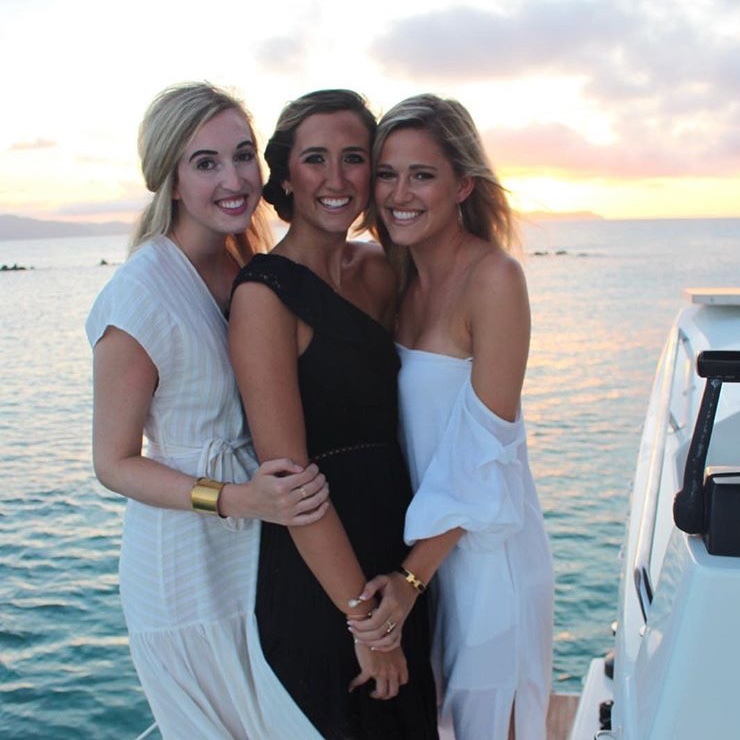 The boat and the BVI are amazing, but the two of you really made the experience fantastic! Great meals, great moorings. sailing lessons, hikes, snorkel spots, fishing and private beaches were all highlights. What a fantastic week! I’m sure you have spoiled us for any other charter. No one else could possibly meet the standard you have set. We loved the sailing and felt very comfortable with our skilled Captain! Thank you for letting me play like I was a helpful deckhand. You two are very friendly and made us feel welcome aboard the whole time. We were amazed that you could put so many wonderful meals on the table without appearing stressed. This private sailing charter experience far exceeds that of a company charter! I sailed aboard Allende for a week around Menorca, Spain, and it was incredible in every aspect. Julie and I are still talking about the wonderful trip on Allende along the Costa Brava. Graham and Kristiann, you both were such fun to be with and were wonderful hosts. Your boat is beautiful and very user friendly with plenty of room. She has all the creature comforts that make for great day of sailing and relaxing evening anchorages. The food was outstanding. Not only do you handle your boat with the skill and confidence of experienced sailors, you really impressed us in the galley. The food was excellent and interesting.